POUND EXCLAIM # ! 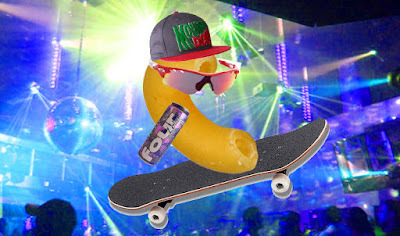 : Macaroni: Too Turnt? Every person who eats carbs (less and less these days) or was ever a child (most people) are familiar with the macaroni noodle. From Aunt So-And-So's terrible mayo-drenched cold mac salad to down-home-style-restaurant's giant tray of breadcrumb covered real cheese mac to I'm-sad-and-alone-or-a-child Kraft Mac & Cheese, it's macaroni all the way down. But is macaroni 2turnt? Channel SHFT31 Investigates is on the scene to find out more. Most people who speak English use the terms "noodle" and "pasta" interchangeably. 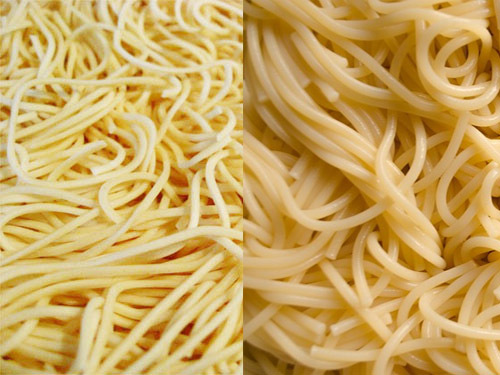 But did you know that there is a difference between noodles and pasta? There must be, because it has its own subheading. It's not as easy as differentiating, say, whiskey/bourbon/scotch. Check it out: spaghetti is both a noodle and a pasta. Couscous is a pasta but not a noodle. Ramen is a noodle but not a pasta. Pool noodles are neither pasta nor noodle, despite having noodle in the name. Is it what they are made of? Sorta, yeah. Many Asian noodles are made from rice instead of grains. I'm reading several other sites trying to get a solid answer on the actual difference, but it seems like there's no hard fast line. And also no one cares. It doesn't matter. Macaroni is also known as elbow pasta because it is shaped like an arm that is bent. A Lego arm. Tube. Thingy. No one has arms that bend like a macaroni. But it is bent. Is it too bent? I've seen some macaronis that are, like, half of a circle. I don't know the math, but that is a lot of bending. I use but too much. Compared to spaghetti, macaroni is way too turnt. Spaghetti is the button-up straight-laced gentleman of pasta. Handsome, welcome at every party, easy to break in half, and fun to slurp. Spaghetti is the poster-boy for pasta. Speaking of pasta that likes to party, what about farfalle? That is the pasta shaped like a bow-tie. Here is a pasta dressed to party. It might be more turnt than even macaroni, but probably not since it only goes to classy affairs. 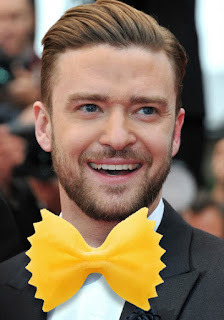 It is known to be Justin Timberlake's favorite pasta. 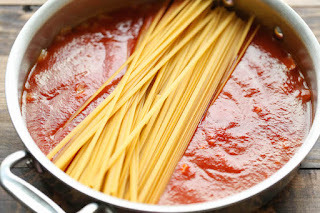 Other pastas less turnt than macaroni include spaghetti's many cousins: thin spaghetti, extra thin spaghetti, angel hair pasta, fettuccine, linguine. So many boring straight noodle pastas. There are pasta shaped like shells! How nuts is that. They aren't turnt tho. They are beautiful. I want to drizzle them in oil and fill them with cheese. Do yourself a favor and download a jaypeg of pasta types and print it out and hang it on your dorm room wall. There are so many. But are any as turnt as macaroni? 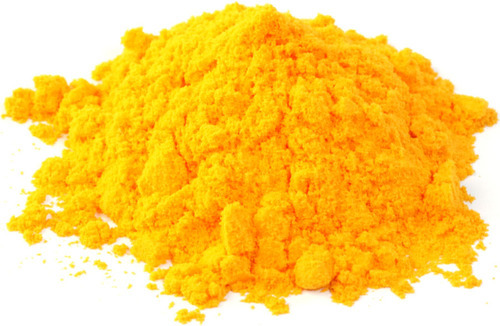 Kraft Mac & Cheese and its store shelf counter parts are the only macaroni that come pre-packaged with a sack of atomic orange flavor powder. That is pretty turnt. Does a Spongebob shaped pasta count as macaroni? I'm curious. According to the box it's still macaroni, only in a spongebob shape. That is blowing my mind. Is Spongebob the elbow pasta? Spongebob is turntaf. A pasta pillow filled with cheese or meat. If macaroni is a 1996 Turbo charged Toyota Celica, then ravioli is a U-Haul truck. And inside the truck is not used furniture, but a party. Don't even get me started on tortellini. 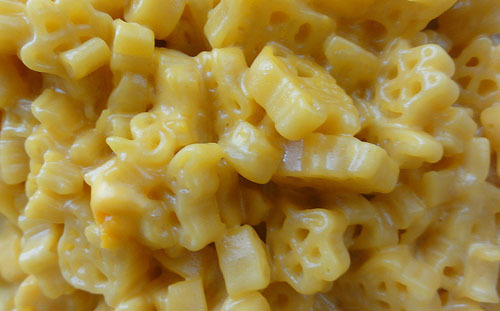 What is the most mac & cheese you think you could eat in one sitting? I could probably do a box. That's a half stick of butter though. That's almost too turnt. I think mac & cheese should have their own Vine page and it would have Tony Hawk doing sweet tricks before eating some m&c with a big cheesy grin. Or Craig Kilborn could do hilarious commentary on people about to eat m&c.